Sift cake mix into a small bowl and set aside. In a large bowl, combine eggs, oil, vanilla extract, milk and sour cream until smooth. Fill cupcake liners 3/4 full and bake for 16-20 minutes or until an inserted knife comes out clean. Chocolate frosting: Beat butter. Add cocoa powder, 2 C. powdered sugar and milk. Slowly add more powdered sugar until you reach your desired consistency. 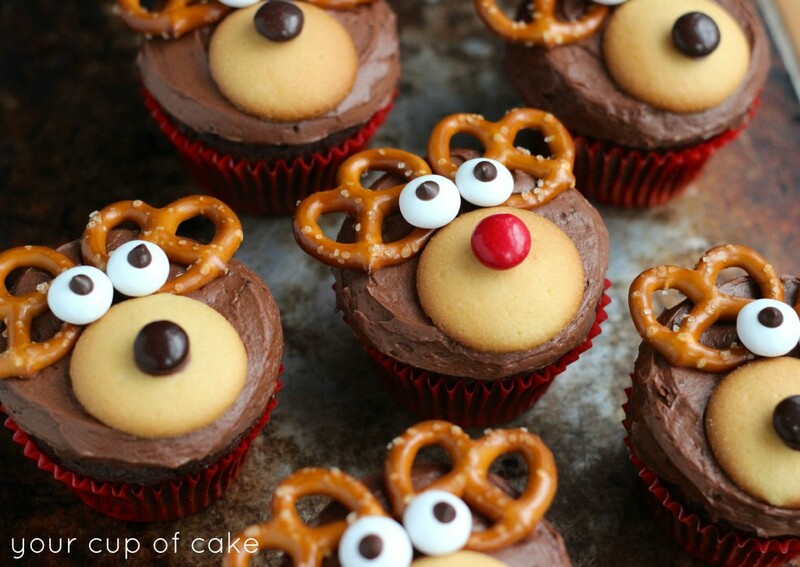 Prep reindeer “faces” by using frosting to stick brown M&M’s on Nilla Wafers (some red for Rudolphs if you want). Melt down a few chocolate chips, put in a small plastic bag, snip off the tip to make a mini piping bag and “dot” little eyeballs on the white M&M’s to make eyes. (See photos below) Place Nilla wafers with M&M’s on cupcakes, then place pretzels above. Use a little frosting to stick on 2 eyes and there you go!